Simple, secure & complete solution to manage large number of SKUs and PLUs integrated with weighing scale, barcode printer & scanner, pole display and cash draw box. 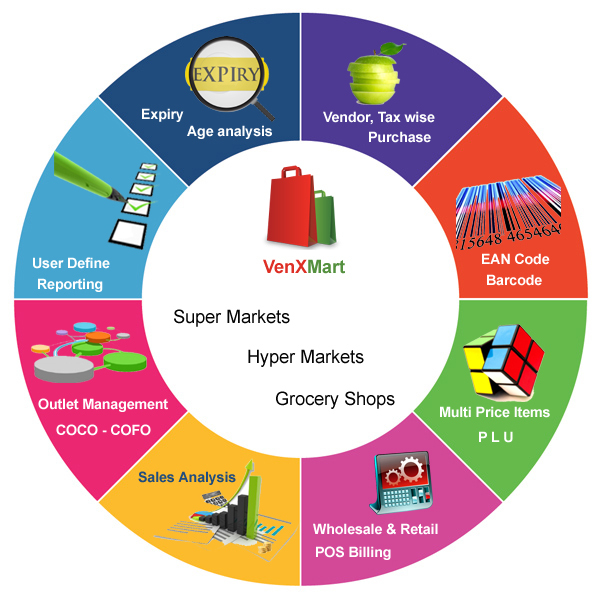 Fast & continuous customer checkouts are ensured always with our vast range of billing options. Automated alerts through mail or sms to top management for MBQ. Shortcut keys to retrieve barcode for items. Pickup item from multiple rates (PLU wise). EANCode can be used instead of taking barcodes. Barcode tracking for dead stock or Expiry Items. Barcode tracking for alteration in changing price. Log reports for promotions and price changes. Price selection for multiple price products. Vendor wise price change analysis. Age Analysis reports (Days wise, Months wise or Year wise). Age wise promotions. (Ex Give 10% Discount to group of items which are above age of 1year). Alerts for upcoming expired stock. Return expired stock to vendor. Removal of expired stock from the inventory.